Streaming on Twitch can be very resource heavy so you need to make sure your computer is capable of running such demanding tasks. You will need at least 8gb RAM for starters, and a suitable multi-core processor such as an i7 920. This is essentially your branding and is very important, remember you'll need to use the exact same name on social media accounts too e.g Twitter, so pick one that is available on all. Once you have picked this username then you're stuck with it (unless you signup again), so choose carefully. You will need a "Stream Key" in order to stream your activity on Twitch. You can get your Stream Key by simply accessing your Dashboard area on Twitch and then clicking the "Stream Key" link like this... A popup should appear, click Accept and then copy and paste this Stream Key into a notepad file as you'll need this for later. We recommend using Casumo as a starting point, as this is a well respected Casino that does not allow free play so your viewers instantly know you're betting with real money. 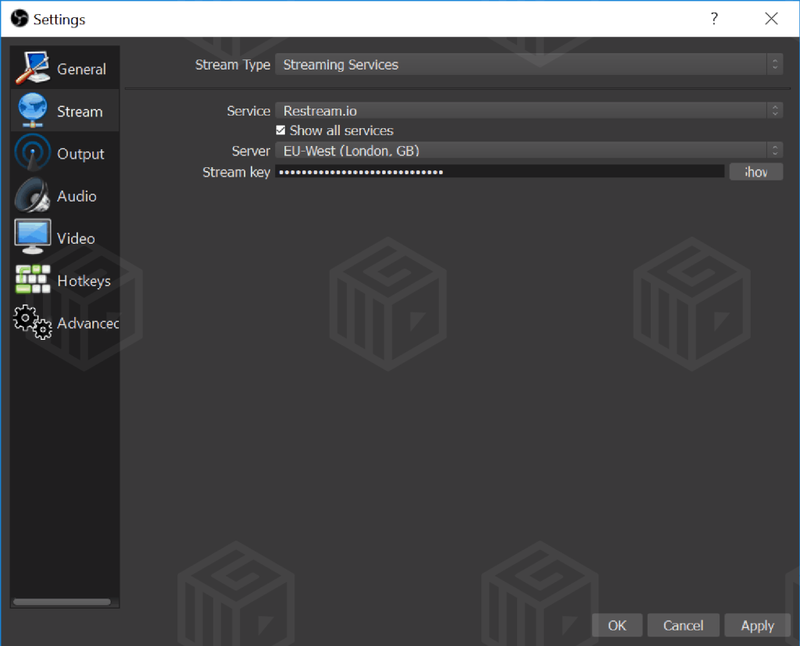 OBS, or Open Broadcaster Software, is the most popular open source solution for streaming your Casino Game activity on Twitch (and other sources). I use OBS to stream Casino Slots 5 days a week and it never lets me down. I recommend you use the 64-bit version of OBS (if you have a 64-bit Operating System). Download: Here When the OBS software installs it will create a 32-bit version of the software on your desktop, you will want to use the 64-bit version. Once you have installed OBS, open the software... Note the 64-bit text in the window title, this shows that you are running the correct version. Once you have the software open click the "Settings" button located at the bottom right (above Exit). 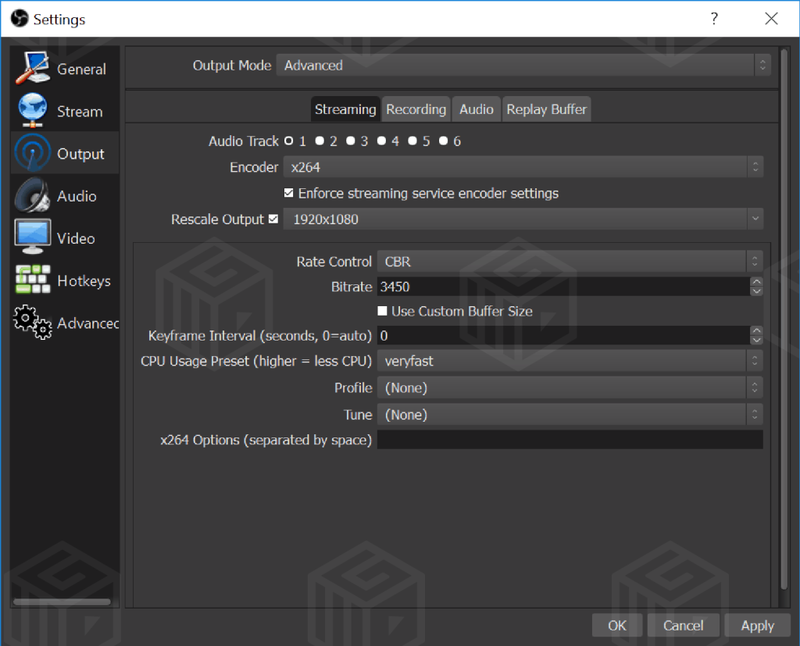 Now click the "Stream" tab located to the left of the Settings menu. Take note of these settings carefully. Select the Service you would like to use for your stream whether it be Twitch, YouTube or something else. Select the most suitable "Server" which is nearest your location. Note: The nearer the Server doesn't always mean a lower latency so experiment with the other "near" locations. 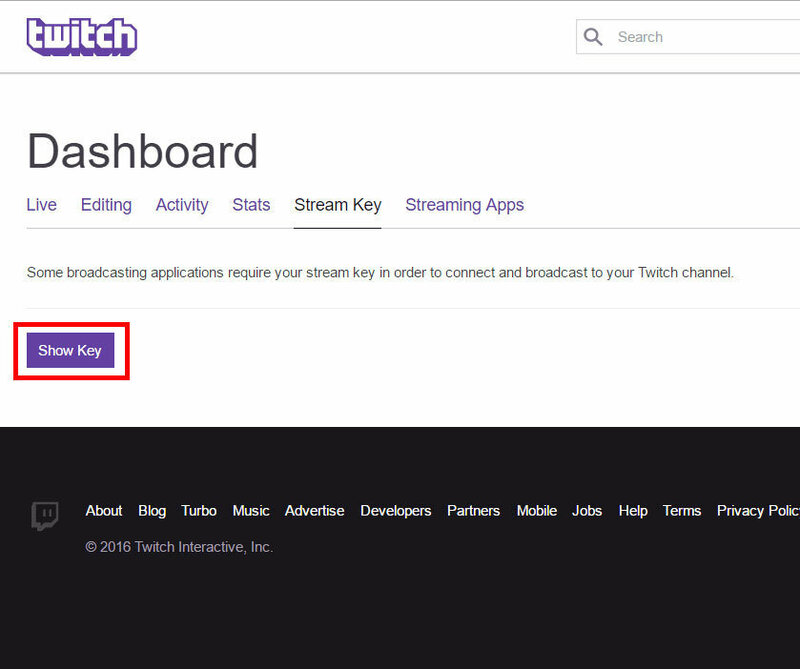 Enter your Stream key, if using Twitch use the key mentioned earlier on in this guide. The "Output" tab contains settings on the level of quality for your Stream. I recommend you use the "x264" Encoder. If your monitor resolution is higher than 1080p then make sure you rescale it down to 1920 x 1080. Note: You can choose to stream at 720p if you would prefer, just make sure you set the rescale option accordingly if you decide to do this. Set the Rate Control to "CBR". 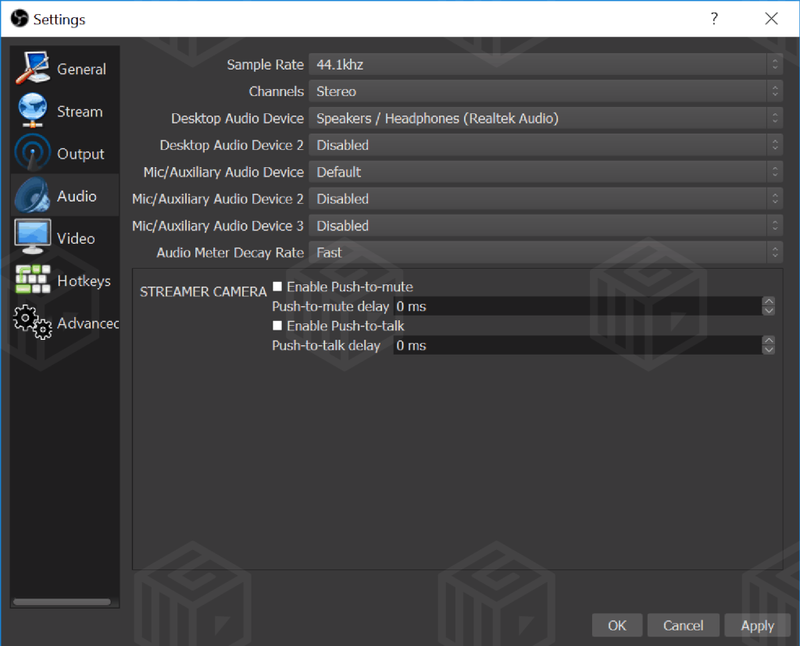 The Bitrate can be set per streamer depending on the quality of settings you use for your stream. You can experiment with this figure until you reach 0% dropped frames. Leave the other settings as they are. 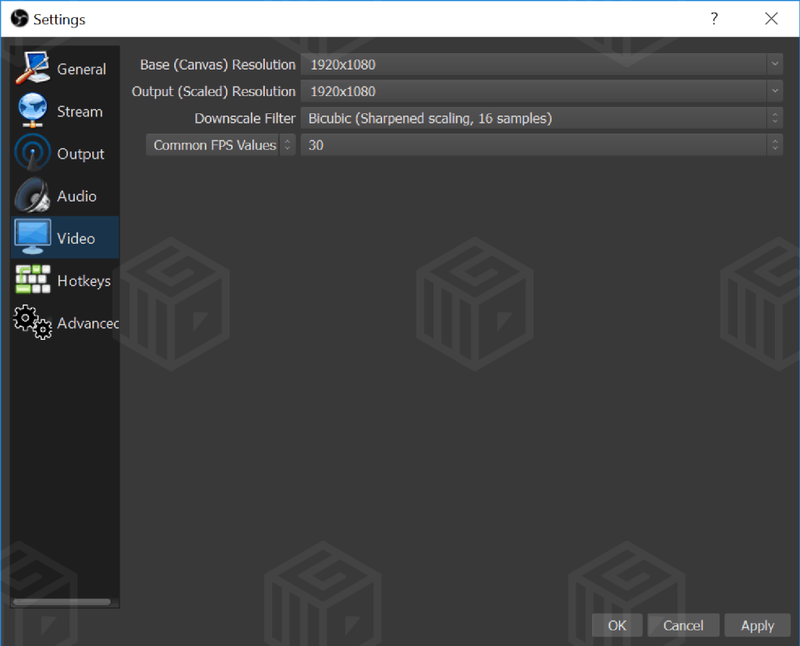 The Audio settings tab is quite self explanatory, but i recommend you set the Sample Rate to "44.1khz" to ensure your viewers get the best audio quality. The "Video" tab in settings controls what resolution and quality your stream will be. I recommend you use a minmum of 1280 x 720 resolution with the Filter "Lanczos (best detail, 36 samples) with an FPS of 60, but 30fps is also sufficient. I personally use 27" monitor which outputs at 2560 x 1440 then i downscale this to 1920 x 1080 for crystal clear quality. The next thing to do is create an appealing Twitch layout, which your viewers will see. 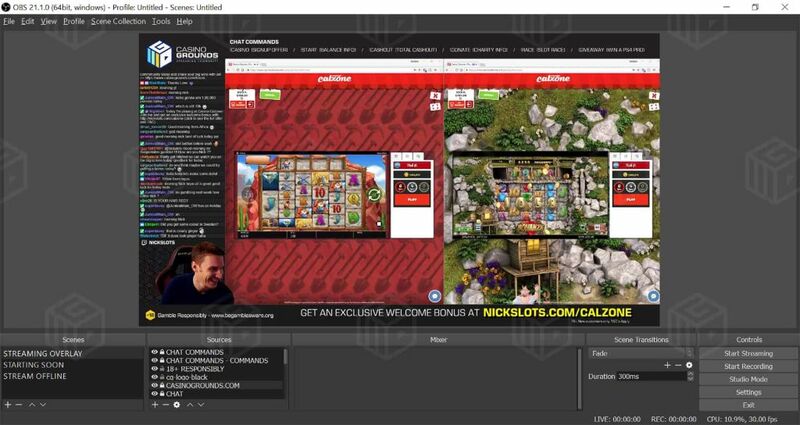 This is how I, NickSlots, have my OBS layout setup. This is the basic structure I use. 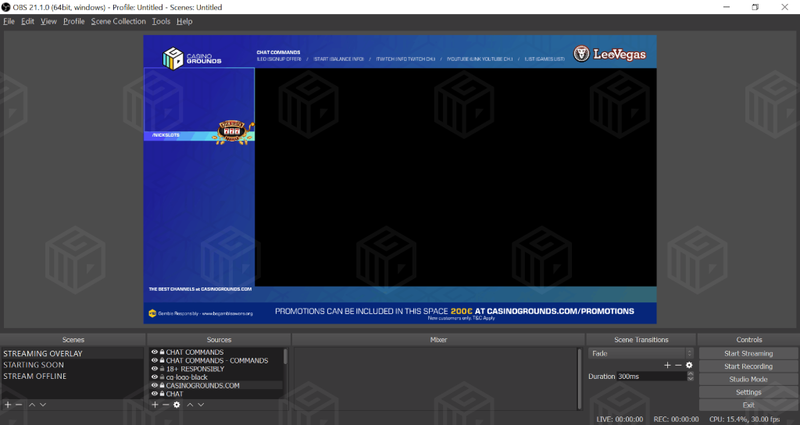 Webcam bottom left, NightDev chat top left, promotion bottom of stream with relevant UKGC compliance, and the Casino displayed in the main area like this... This structure gives plenty of room for the Casino layout. If you're streaming multiple Casinos then you'll need to setup a new "Source" for each as they all have different layouts. This structure is the foundation of your stream. The Key Features: Webcam, Chat, Branding, Promotions and ofcourse the Casino. In order to achieve a similar layout you will need basic Photoshop skills, or you can hire someone on Fiverr to make you a logo. There are some free Twitch layouts here. Now in my Twitch setup i use Two monitors, like this... The left monitor (34") is used to display OBS, TwitchAlerts, Twitch Chat and YouTube chat. The right monitor (27") is used to display the Casino Slots. 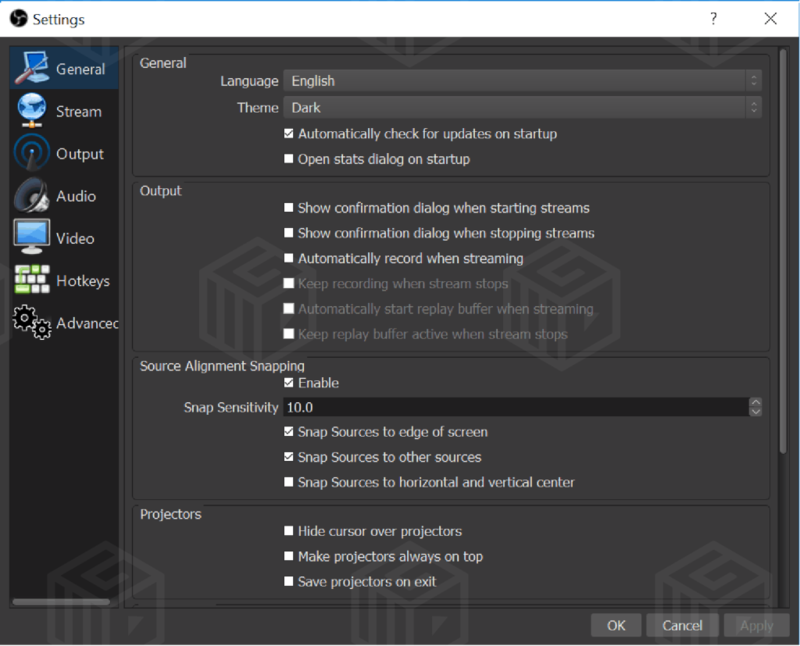 In order for this to work in OBS i need to first create a "Source" by right clicking under the "Sources" panel and click "Add > Display Capture". And you should see something like this... Select your "Display" from the drop down box and then adjust accordingly after clicking OK. Note: For some reason the display wasn't showing in the preview screen in the above screenshot, but it still works (as seen underneath). 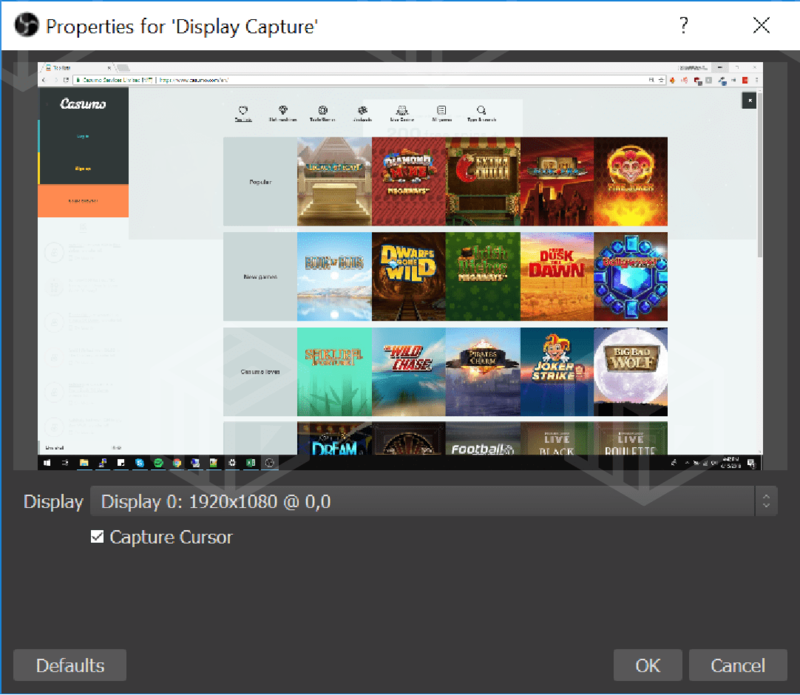 Now that you have your Casino Slots window in view on OBS, you can start by adding other features... You can add images such as your logo using the "Image" option, Browser Source which is used for things like TwitchAlerts, Video Capture Device which is your webcam and Game Capture which is for PC Game windows. Have a play with each of these and learn the in's and out's of the program. Displaying a chat room on your stream is very simple, by using the NightDev KapChat source. 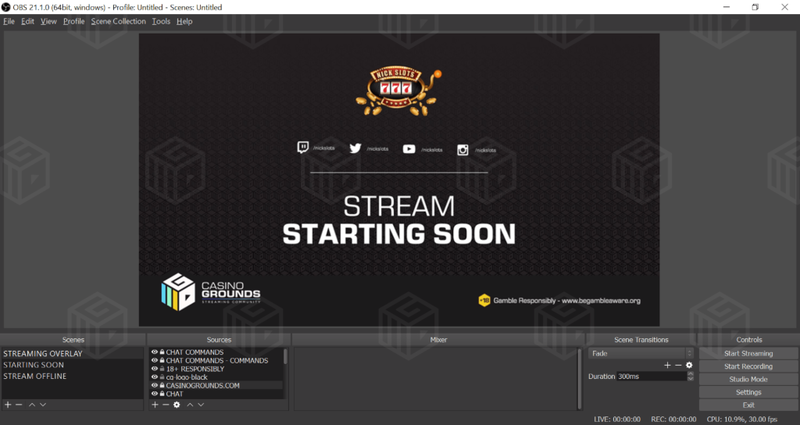 Chat Setup: Here Make sure you have OBS installed with the Browser plugin and then after you enter the relative details on the NightDev KapChat page you will get an URL, simply enter this URL as a "Browser Source" in OBS and your chat room from Twitch should be displayed. I use the same chat room on all my streams and it works very well. Anyone can stream on Twitch and YouTube, but not anyone can make a successful channel with regular viewers and consistent high viewer figures. 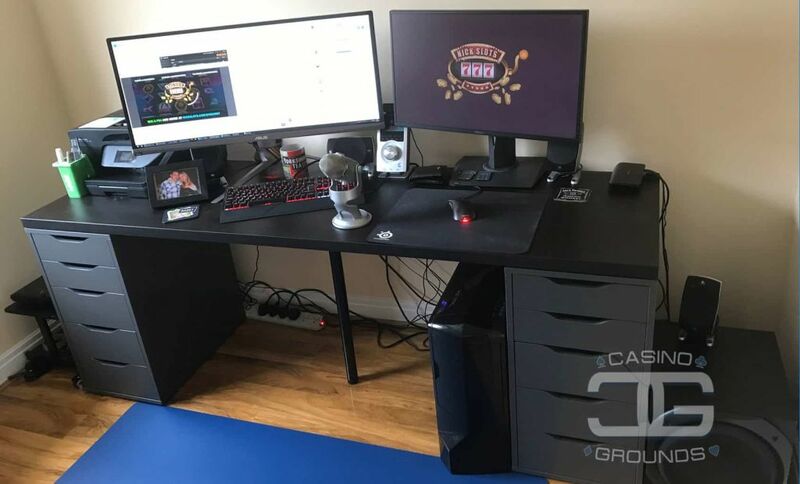 Here at Casino Grounds we pride ourselves in streaming only the best Casino Games content available from multiple reputable Casino's. Here is a list of "Do's" and "Don'ts" which we try and follow every stream, and you should too. Just remember it can take months to grow your channel to a point where it's profitable to stream slots, try and be patient. If you are a Casino Grounds partner then we will do our best to bump up your viewer count.